The standard I/O options for C100 and C10 Digital Broadcast Consoles can be augmented with a collection of hardware and turnkey system options to expand console flexibility and provide IP Audio Networking, loudness monitoring and recorder options. 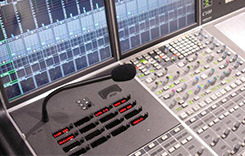 A unique feature of SSL broadcast consoles is the capacity to integrate a selection of essential broadcast technology into the console control surface. This innovative approach has several significant advantages: It delivers ergonomic and workflow optimisation via hands on control over multiple systems from a single control surface. It also completely removes the requirement for a range of individual dedicated products, each of which would require physical space, consume power and generate heat. Additional external hardware options maximise use of space and improve facility wide integration. The C100 HD PLUS uses a penthouse design with an integrated TFT screen. This can be used to display a wide range of metering systems from various manufacturers or SSL's own LMS-16 multichannel Loudness Monitoring system. *C100 only. C100 and C10 channel bay's TFT displays can be switched as an option to an external VGA source, i-e to display a specific metering system, external matrix display or DAW display. This can potentially eliminate requirements for a number of external displays. The optional monitor arm attaches to any C100 or C10 console regardless of trim type. It offers an elegant screen mounting option for VESA mount screens up to 24" in size. This option is ideal for use with SSL's LMS-16 Loudness Monitoring or Live-Recorder systems. Arms can be mounted on either or both sides of a console. 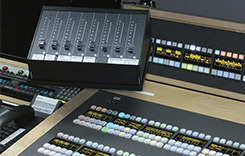 Requirements for simple fader control to be located in the Production Gallery or Main Control Room or anywhere else in a studio or Ob vehicle can be satisfied with a simple Remote Fader Panel for either C100 or C10 consoles. 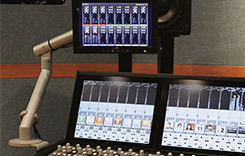 Each panel provides 8 faders and connects to the console via a dedicated Ethernet connection. 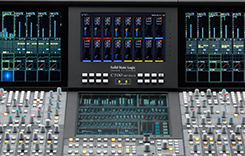 SSL C100 and C10 consoles can be connected to Dante IP Audio Networks using the SSL Network I/O MADI-Bridge. Complete information about the MADI-Bridge and the rest of the SSL Network I/O range can be found.here.